Heads up, the world is about to get a pinch more delightful as Netflix prepares to bring b-b-b-b-Bill Nye The Science Guy back to the airwaves in the form of a brand-new talk show called Bill Nye Saves The World. 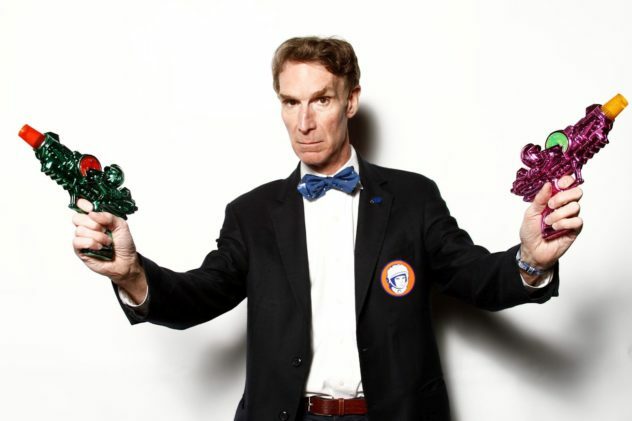 William Sanford “Bill” Nye has been a huge part of bringing the fun of science into childrens’ lives since his seminal PBS show began airing in 1993. In the wake of that show’s fifth and final season, he has popped up everywhere from Battlebots to news channels, Dancing With the Stars (seriously, he performed Weird Science by Oingo Boingo) and more. Now that many of his fans from the early nineties have grown up, it only makes sense that a Netflix talk show would be the next logistical step in his career, as well as the most obvious place to build a new audience. Sure, a YouTube could have been an option should they have chosen to angle towards a younger demographic, but from the sounds of the press release Bill Nye Saves The World will bridge the gap between accessible and entertaining discussions paired with serious and timely subject matter. Today, Netflix announced that it will launch a new talk show, Bill Nye Saves the World, hosted by the famed scientist, engineer, comedian, author and inventor. Set to launch Spring 2017, each episode will tackle a topic from a scientific point of view, dispelling myths, and refuting anti-scientific claims that may be espoused by politicians, religious leaders or titans of industry.